* And….sleeping in 54 different beds The Watanabe-Swagemakers family is back in Canada. To reflect, appreciate and let our world experiences settle in, I did a family interview to get everyone’s perspective on the past year. As this journey has ended, a new one is beginning: we are moving to Bangkok, Thailand in September! As a family, we are thoroughly thankful for this past year (an amazing dream come true), and super excited about our new, upcoming life in Asia. We can only wish (and encourage) everyone to pursue their dreams – it makes you come alive in ways you didn’t know were possible. Thanks to you all for following our adventures on Facebook, and on our blog (http://yolomomonthgo.wordpress.com) – your enthusiasm (even when you despised us as we were posting sunny beach pictures of Thailand during one of the worst winters in Canada) has meant a great deal to us. So, dank je wel, muchas gracias, thank you and merci! I will try to keep writing about living in Thailand but now we are signing off to spend some quality time with family & friends…Y.O.L.O everyone! Anthony: Driving around Newfoundland in an RV made me proud to be a Canadian. The natural landscape is absolutely stunning. Rose: Lobster feasts in Nova Scotia with grandpa Jichan, James & Ayako. The kids skinny dipping in the ocean at “Happy Beach”. 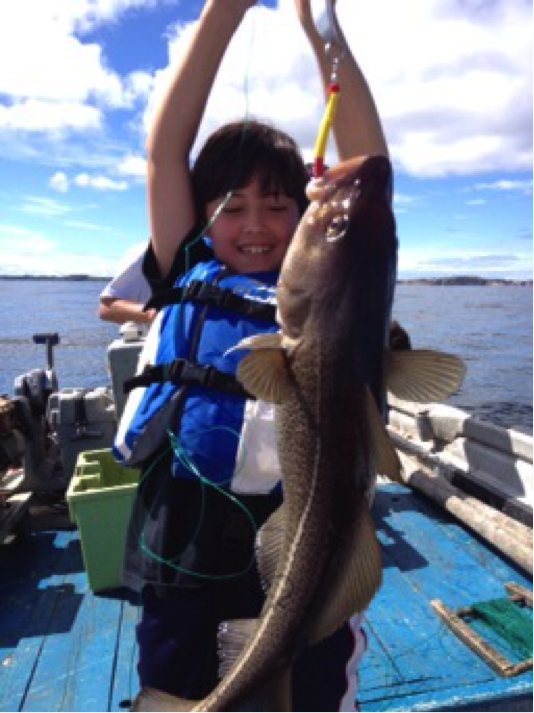 Emile: Catching the big codfish with Captain Dave in Newfoundland. Felix: Very peaceful RV travel around Newfoundland; you can sleep anywhere you want. Anthony: Great weather with Oma and Opa in August, as opposed to our many visits during Christmas holidays over the years. The B&B in Maastricht where, without the kids, Rose and I awoke each morning to a breakfast of classical music, linen tablecloth and lekker Dutch treats. 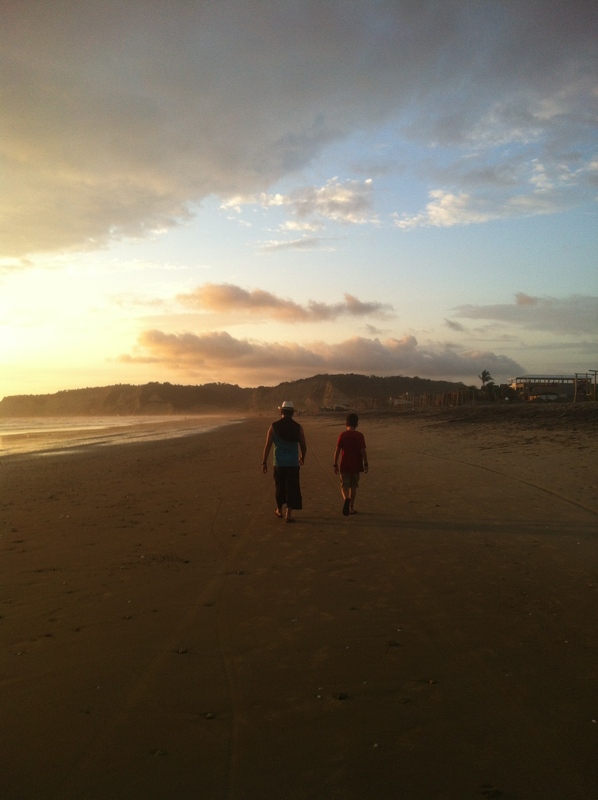 Rose: Seeing my parents show Emile & Filou their country of heritage for the first time….Such joy! 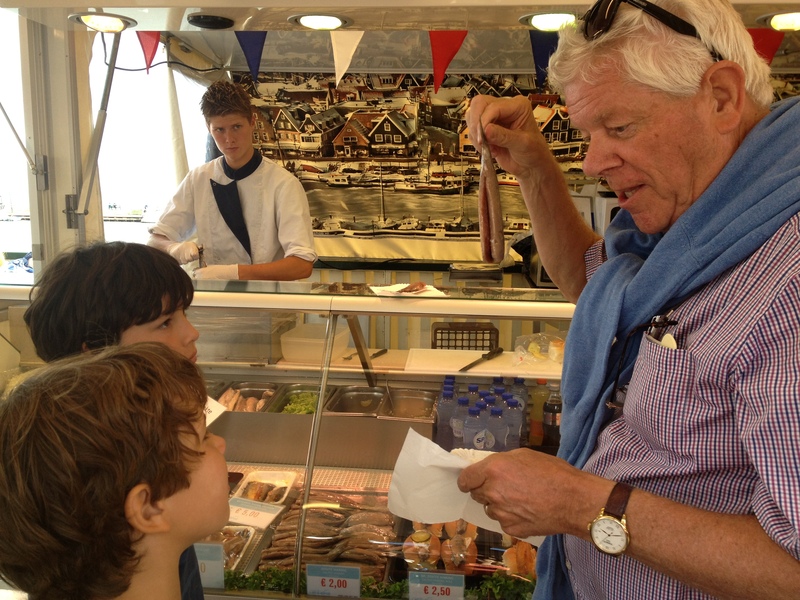 Eating herring up-side down, tasting delicious cheeses, climbing windmills, riding bikes in the beautiful countryside, going to the Aalsmeer Flower Market etc. Emile: The best was my 10th. birthday celebration with Opa and Oma. And I loved eating all the delicious food. Felix: Spending amazing times with Opa & Oma. Eating kroketten and Dutch cheese. Anthony: Emile heading off to the supermarket by himself (his independence was starting) and returning not only with a baguette but also a Parisian accent! Rose: Strolling the local food markets and re-living France memories with the love of my life. This is where it all started! 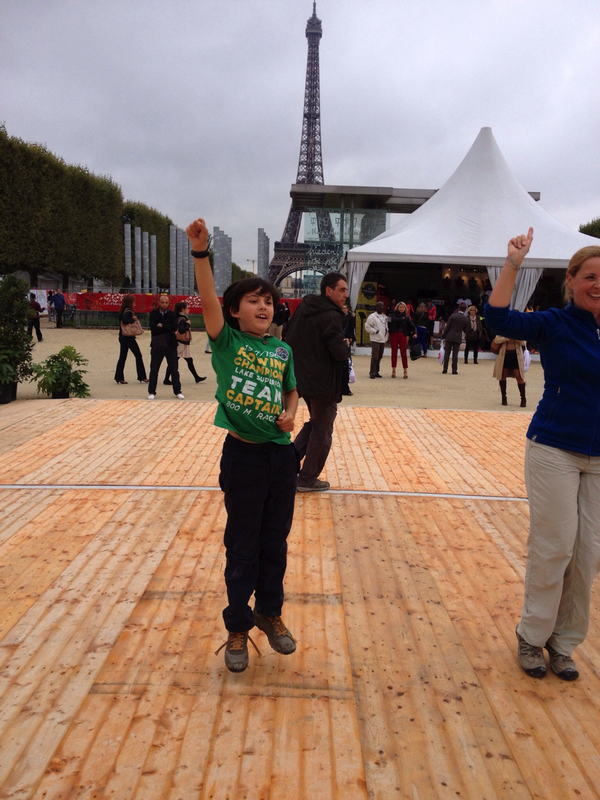 Emile: Eating Japanese food while dancing in front of the Eiffel Tower. Felix: Playing in the beautiful parks of Paris, especially the play park in le Jardin du Luxembourg, one of papa’s favourites. Anthony: Walking the labyrinthine streets of the Dong Cheng area of Beijing where there were tons and tons of people walking and eating at all hours of the day. “Shuffling” was the only way to move through the crowds. And rock climbing, it all started in Yangshuo! 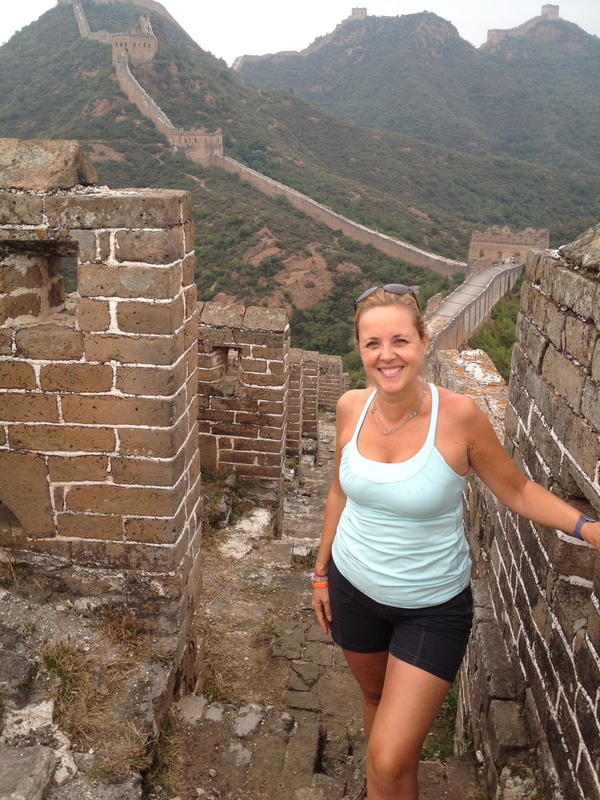 Rose: Hiking the wild and most preserved part of the Great Wall of China while taking in the stunning scenery (China & Mongolia). Such a privilege to walk on this incredible structure & piece of history! And gliding down the beautiful Li river on a bamboo raft in Yangshuo – taking in the stunning Karst mountain scenery. 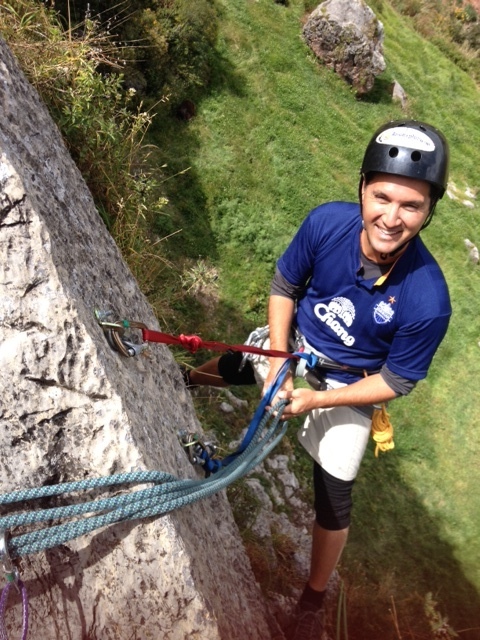 Emile: First time rock climbing experience, great food & friends. 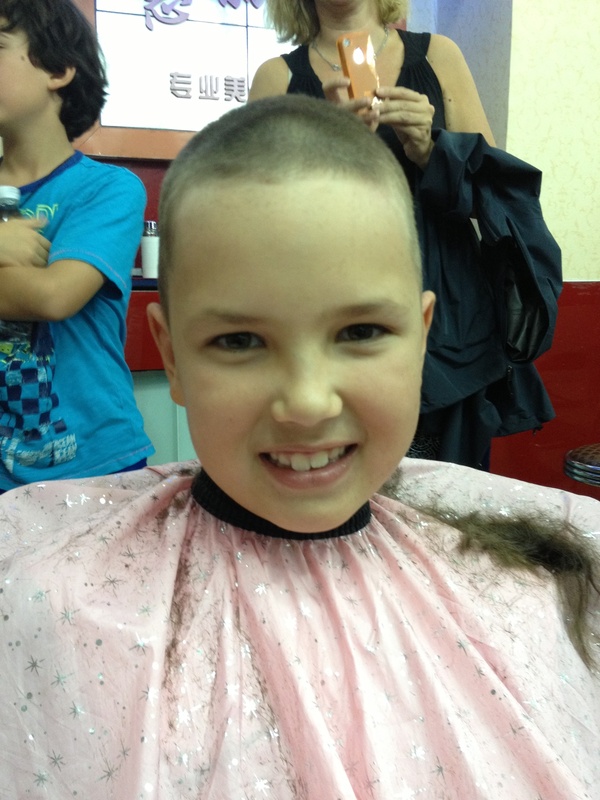 Felix: Running ahead of the family on the Great Wall and getting my head shaven. Anthony: First morning in sweltering Ho Chi Minh City, the first taste of Vietnamese coffee knocked me over. By the end of our month, I was making my own and loving it! Pho soup on the streets of Hanoi with Emile and riding a motorcycle in crazy traffic! 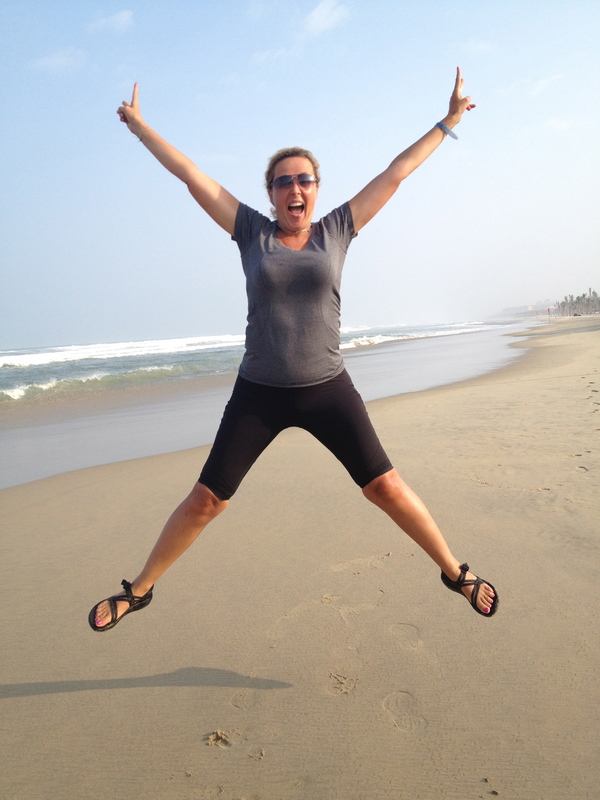 Rose: Enjoying the peaceful beach life in Hoi An and riding a motorcycle on the Hai Van Pass – right into the clouds. Emile: Living through the aftermath of Cyclone Hayan; one of the world’s biggest hurricanes every recorded (lots of rain and wind). Felix: Everything, especially eating Pho Soup! Anthony: Filou getting chased by a monkey at the Angkor Wat temples! 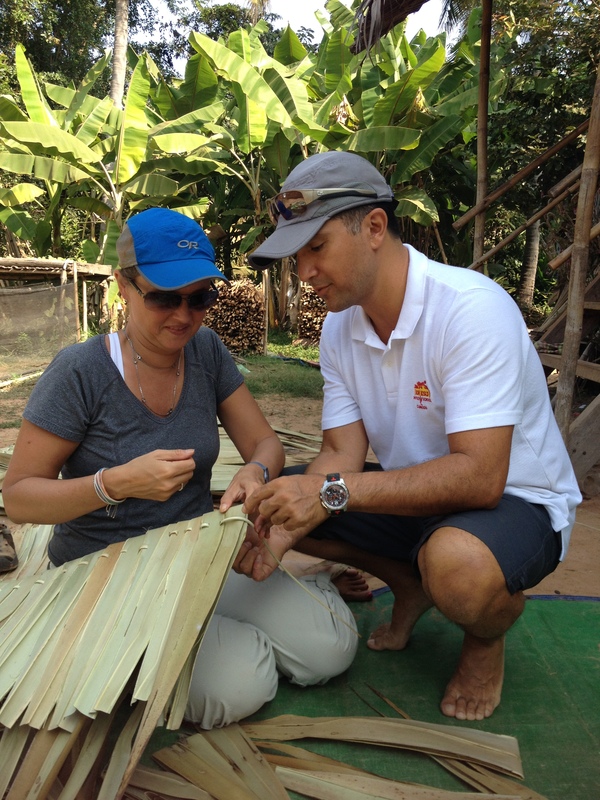 Sleeping in a tree hut in the middle of the jungle at the incredible Jasmine Valley in Kep, and helping make a new roof for a family in need in Siem Reap. 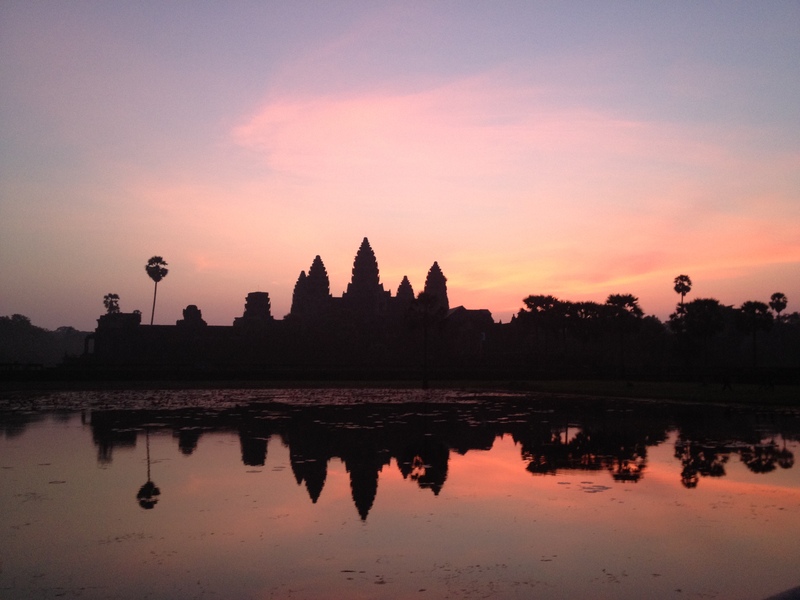 Rose: Seeing the sun come up over Angkor Wat. These temples are truly one-of-a-kind magnificent! And going by boat to gorgeous Rabbit Island in Kep. Emile: Tarzan jumping into a beautiful river in Kampot. Anthony: Booting around on motor scooters, on the left side of the road! The ocean water being almost too warm. Rock climbing with locals and visitors from around the world. Christmas day boating and snorkeling around the islands. New Year’s eve on the beach – kids stayed up until 1am – barely! 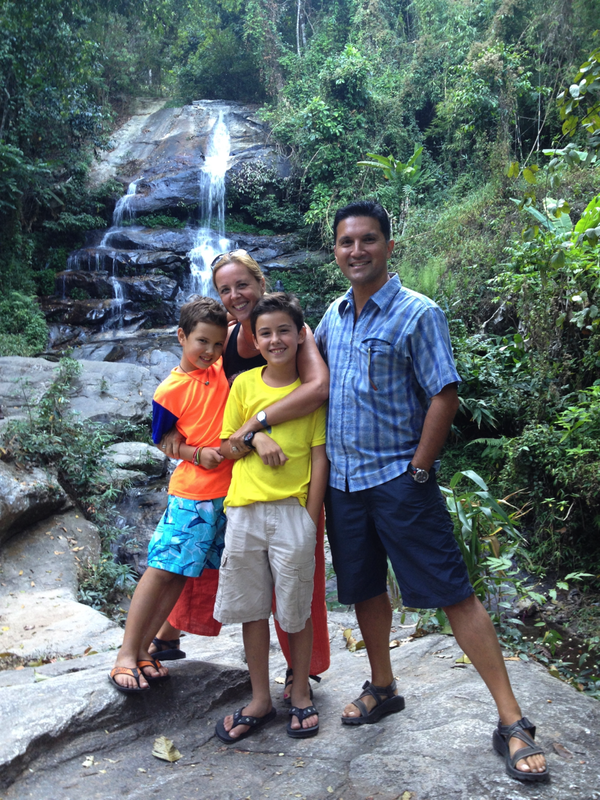 Hanging with our dads in and around Chiang Mai. 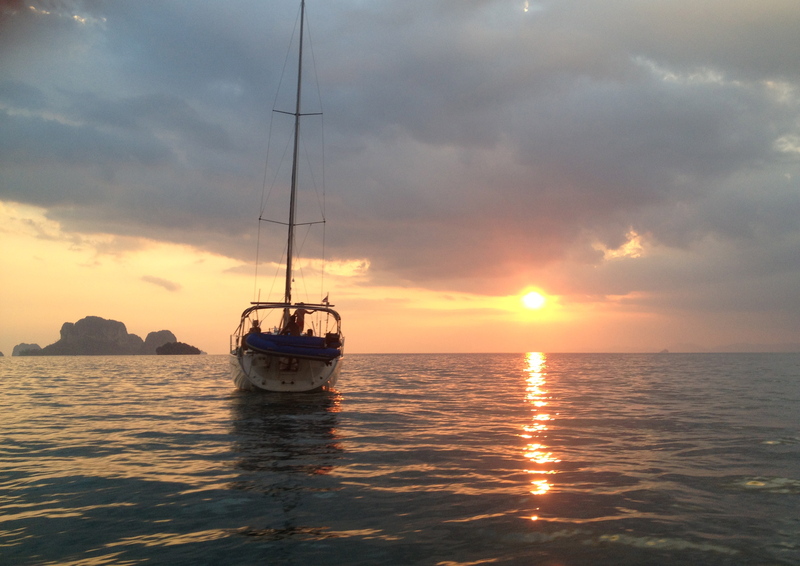 Rose: Too many great memories – can’t choose one: Christmas Day exploring the stunning islands around Krabi by boat. Riding the back roads of Chiang Mai on a scooter with my 75 year old Dad (and having both grandfathers spent 2.5 weeks with us), seeing the children’s commitment to the Elephant Nature Park (ENP) where we volunteered; an incredible love for animals (elephants, dogs, cats etc.) came to light and….Dancing my way into a new year: 2014 while lighting & lifting lanterns into the sky…projecting that one day soon we would come back to this amazing country. Our two months here were paradise! Emile: Amazing people, fun on motorcycles, and the awesome experience of helping the elephants at the Elephant Nature Park in Chiang Mai. Thank you Lek for the amazing work you do to save these beautiful animals. I am going to adopt one (or a dog at your shelter). Felix: Swimming in the pool at the Best Western. Playing with Zack & Sara on the beach and eating the incredible foods, such as garlic chicken on rice. Anthony: Penang and Fiji were tied for hottest places we visited. Fortunately, both had pools. Incredible vegetarian food right outside our apartment – ate lunch there every day after discovering it. Kids’ first music lessons with Nelson near Island Plaza, something which has given us a lot of joy and connection ever since. Rose: Exploring the amazing street art of Georgetown. 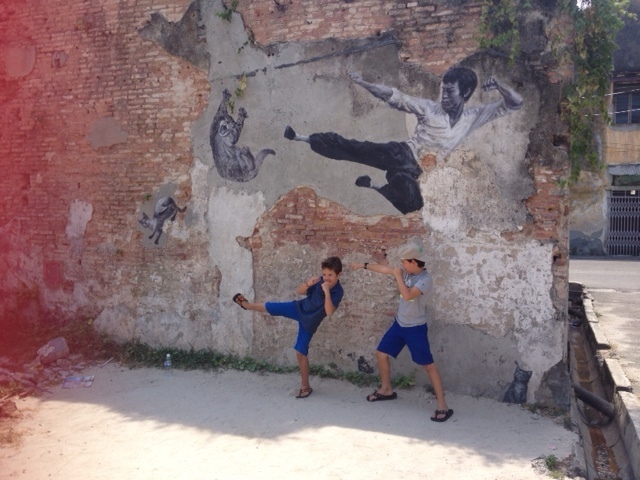 And eating some incredible street food: what a wonderful mix of cultures and tastes, you can find in Penang! Emile: Going to the amazing ESCAPE climbing park to celebrate Ian Minton’s birthday (my new friend from the US). Felix: Starting to take music lessons for the first time: now I love to play the piano! Anthony: Filou playing non-stop piano in every hostel we visited. At that time, he only knew 2 songs: Mary Had a Little Lamb and Happy Birthday. Just imagine. Great mountain bike ride in Rotorua, stunning scenery and sparking my interest in trail riding. 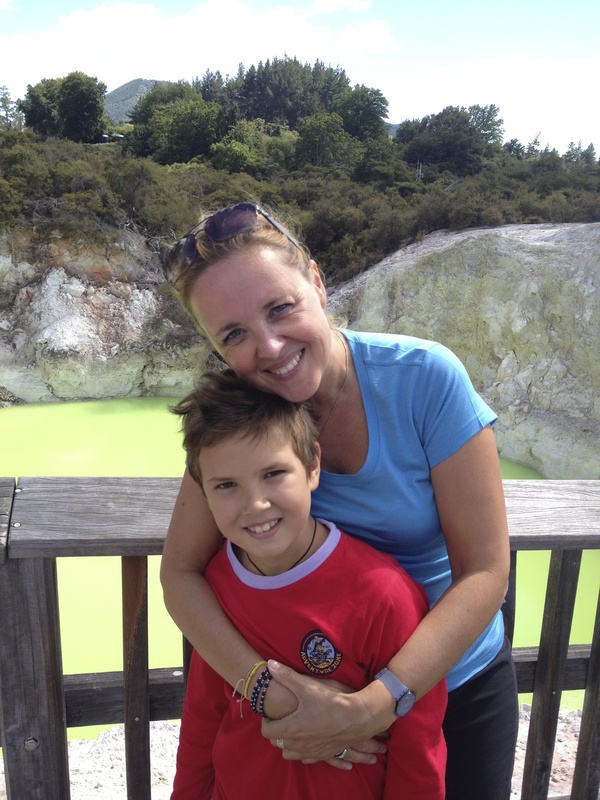 Rose: Seeing the geothermal activity, geysers and hot mud pools at Wai-O-Tapu Thermal Wonderland and learning about the fascinating Maori aboriginal culture. For the first time eating lamb that I actually liked! 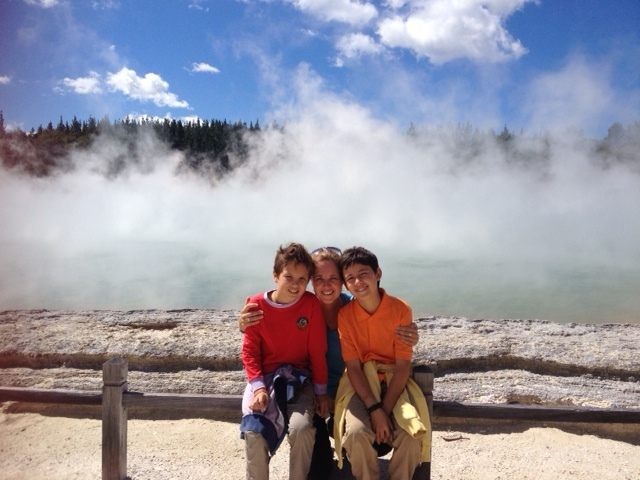 Emile: Cool geysers! Eating delicious lamb, and taking a nice walk around the Auckland Harbour. Felix: Incredible poi dance at the aboriginal Maori show. Anthony: Definitely the impromptu and incredible dinner with local Japanese eccentric, Taku Murai. In his self-designed house mixing both Fijian (think ventilation) and Japanese features (think sliding walls), he prepared us a feast. After dinner, he shared his philosophy of life with us, much of which was written in English and Japanese all over his wood, unpainted walls. These are the experiences you cannot find in guidebooks. Rose: Being invited by a Japanese man to his house. He promised that he would prepare us a meal we wouldn’t forget. And so he did – scrumptious sushi dinner and interesting conversation with this eccentric, lovely man! And lots of fun pool time. Emile: Funny Japanese guy and cooking with Seria, making a delicious parrot fish dish. 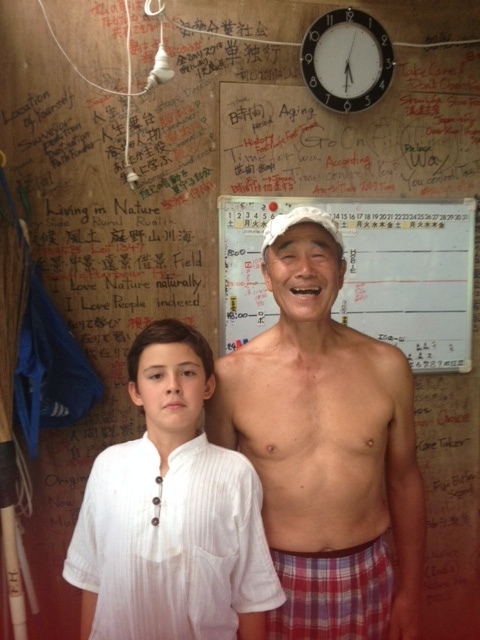 Felix: Building a fort on the beach and the Japanese man. 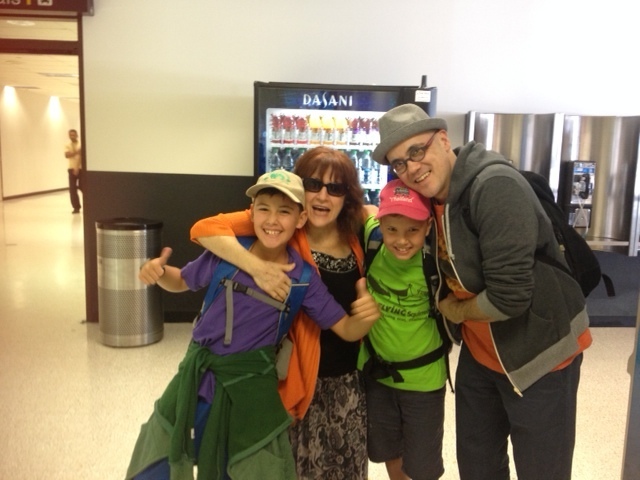 Anthony: Airport reunion with mom and James, kids screaming and jumping for joy. Family bowling and everyone’s body gestures to help guide the bowling ball. After a delicious Mexican meal, singing Karaoke in the bar, complete with cowboys, line dancing and lots of twang! We sang the Bare Naked Ladies. Rose: Hiking the Santa Monica Mountains – enjoying a nice pic-nic lunch and seeing crazy YiaYia (grandmother) still climbing trees to make the kids happy! Emile: Having fun jumping in the trampoline park and bowling with YiaYia and Nuno. Felix: Playing in the park with YiaYia and Nuno. Anthony: Great community in Cusco. Buying the kids their first musical instruments – game changer for their progress. The restaurant owner beside our apartment with gold stars on her teeth – fashion without function? Machu Picchu and other incredible Inca sites. Climbing La Rocca with other families and our guide, Tiffany. Oh, and altitude sickness at 3300 metres during the first week. Rose: Taking part in a traditional Depacho ceremony – giving thanks to Pachamama (Mother Earth) for the abundance she provides us each and every day – surrounded by some amazing friends. Spending 3 days on the edge of the Amazon making a commercial for Scotia Bank …and of course, exploring the stunning archeological site of Machu Picchu. Emile: Making great friends such as Kane Crawford and learning Spanish. 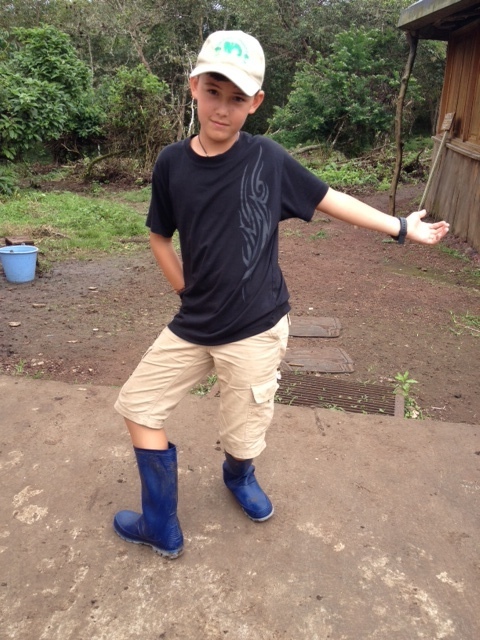 Felix: Having lots of fun with the many friends we made and hiking the hills around Cusco. Anthony: Seeing Lake Titicaca as we arrived in Copacabana – reminded me of how much I love water. Our snail-shaped house at Las Olas Hostel. Oh, and the killer llama there – could tell by his gaze. Snow storm during our tour of the Salt Flats, French tourist falling through a hole during a snowball fight with the kids, sleeping in winter coat, gloves, etc. Rose: Taking incredibly fun pictures on the Salar de Uyuni (Salt Flats) and taking a boat ride on Lake Titicaca, Copacabana to a floating reef village. Emile: Long but beautiful hike on Isla del Sol. 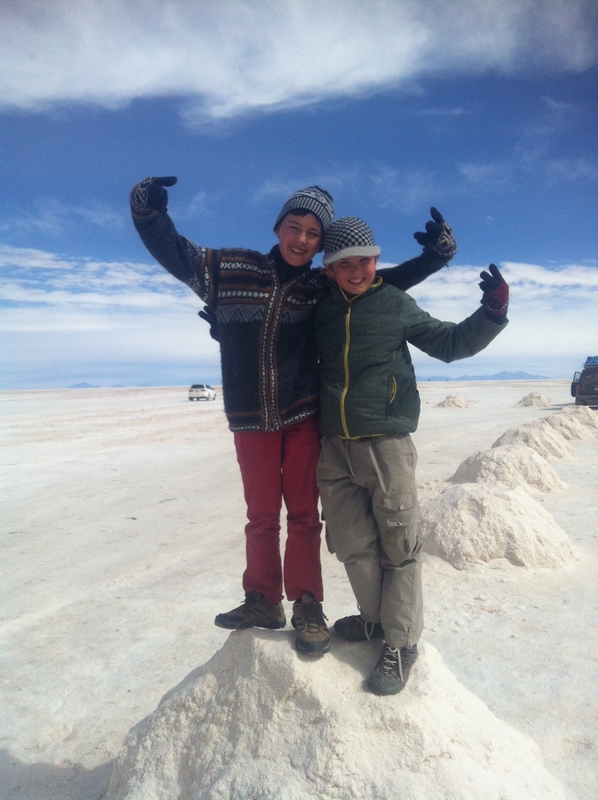 Felix: Uyuni Salt Flat – we took fun pictures and I scooped up lots of salt. 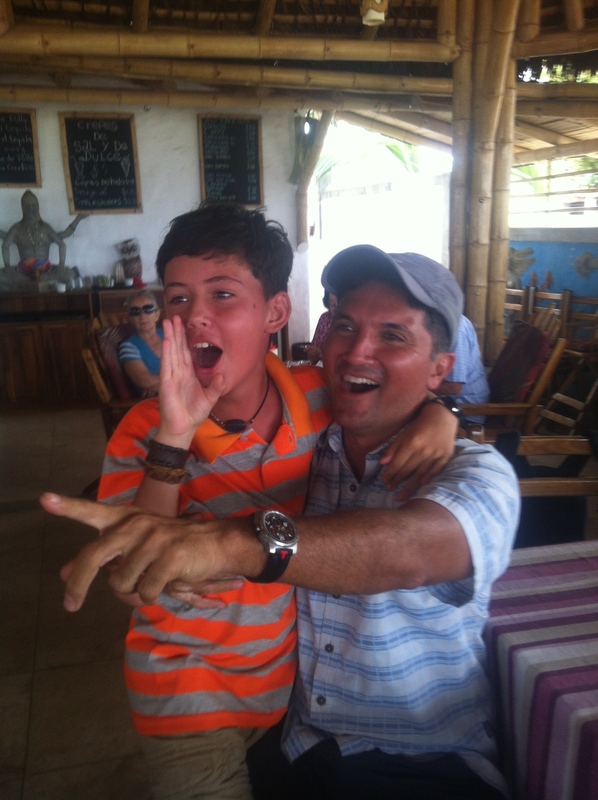 Anthony: Hanging with Filou in Quito while Emile suffered through chicken pox and Rose tended to him. The incredible lightness of being, after yoga sessions in Canoa. Getting into World Cup frenzy with Emile, talking schedules and stats and of course watching the Dutch win their first 4 games. Beautiful beach in Canoa and truly wonderful people there, locals, expats and travellers we met. Rose: Yoga mornings on the beach with Leanne & bonfires with friends… Of course HUP HOLLAND, and let’s not forget PARAGLIDING!!! Emile: Cheering for the Dutch. World Cup frenzy!!! Felix: Learning to surf on some amazing waves. Rose: Being the first person in the family to see a white-tip reef shark that was swimming right below me! I screamed loudly so that everyone could swim back and see him too, but they were too late – it was a real big one too! 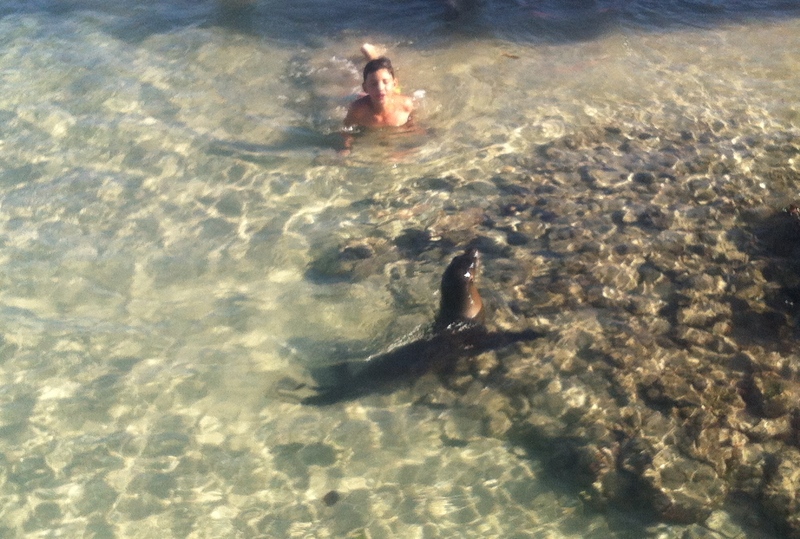 And having a sea-lion play and swim all around me and the kids…so much fun! Felix: Playing with the sea-lions, and playing soccer with David and Martin. 2. WHAT WAS THE SINGLE BEST MEAL YOU ENJOYED, AND WHERE WAS THIS? Anthony: Very difficult, but if I must: Pho Ga on the streets of Hanoi with Emile for $1.50. For each of our 2 nights there, we took a foot massage, followed by the best Pho we have ever tasted. 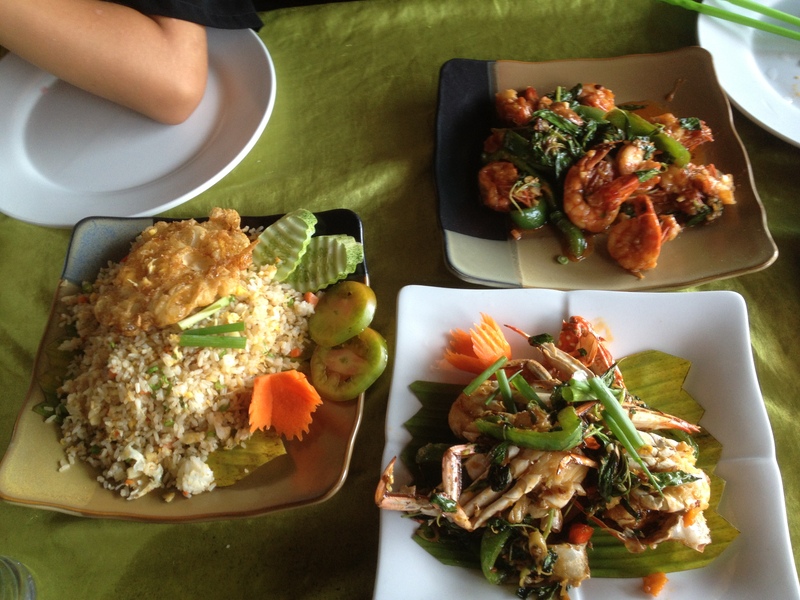 Rose: Ginger Crab in Kep, Cambodia overlooking the beautiful ocean. Emile: Morning Glory (green vegetable dish) in Thailand. 3. WHAT WAS YOUR WEIRDEST EXPERIENCE OR OBSERVATION DURING THIS YEAR? Anthony: I saw anti-corruption messaging on billboards, TV, magazines and newspapers in virtually every country we visited. And at the same time, I was following news of scandal, misappropriation of public funds and dishonesty at every level of government in Canada. Corruption in government is, alas, universal. The difference is the degree and the level of transparency. Rose: Seeing a skinned dog hanging up-side-down in a Chinese food market (during my cooking class market tour), and learning that many petdogs are killed each Fall as it’s a delicacy on menus during that time of year. So sorry for the loss of all your dogs ahLong and Jessie! Emile: Eating Guinea Pig in Peru. 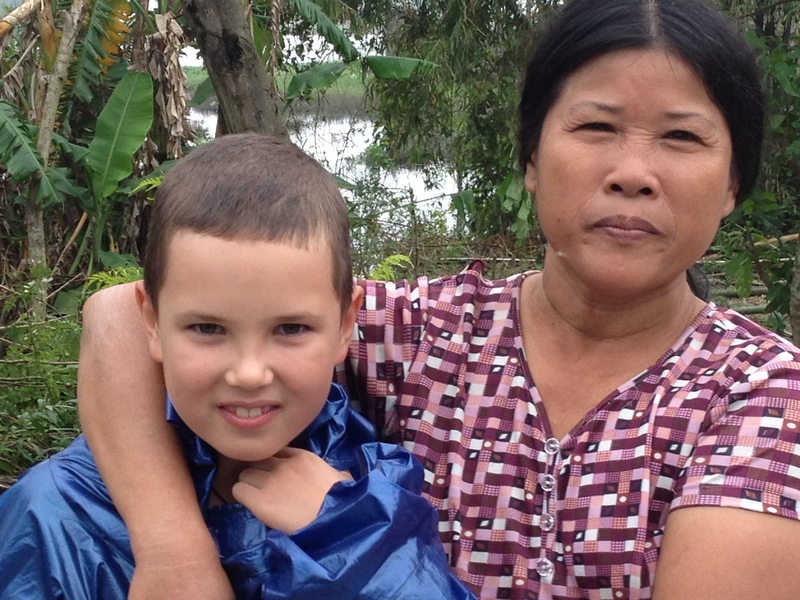 Felix: A lady in a village in Hue, Vietnam grabbing my private part 3 times! Just to be friendly (bit of a crazy custom)! 4. WHAT WAS YOUR FAVORITY COUNTRY TO VISIT AND WHY? Anthony: Overall, Thailand had the most checkboxes. But really, every country created unique experiences and memories for us. Rose: Thailand without a doubt! 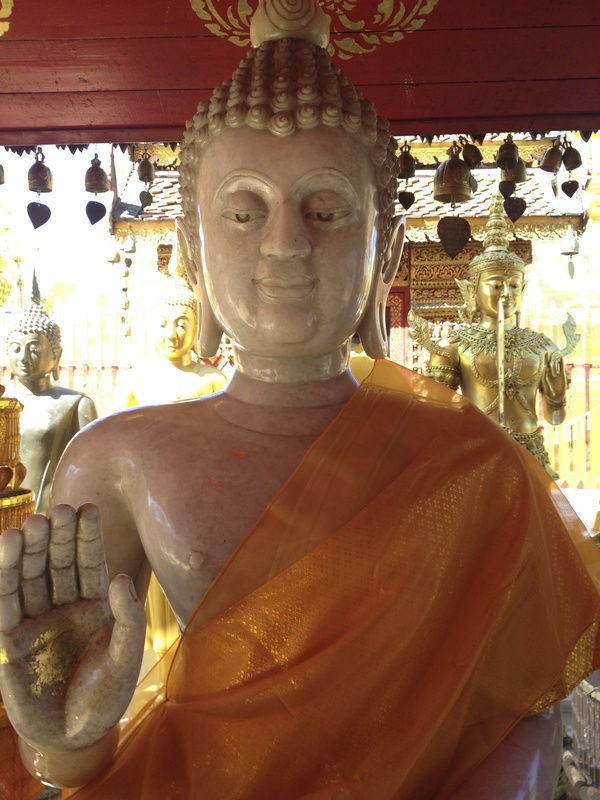 The amazing hospitality of the Thai people, the scrumptious food, the stunning beaches and mountains, the fun of getting around on motorbikes and the SUN, SUN, SUN! Emile: All of them: every country had something special. Felix: Thailand – cause the food always has a little kick to it and you can swim around some beautiful islands. 5. WHAT WAS YOUR SINGLE MOST FUN, EXCITING/THRILLING ACTIVITY? Anthony: Rosie, you’re killing me – boiling it down to one thing is tough. But I realized that Vietnam had a number of thrilling experiences. Driving through the huge, jam-packed roundabouts in Danang on a motorbike en route to the stunning Hai Van Pass was a nail-biter. Then there was the adventure Emile I took to get to Cat Ba Island from Hanoi, including early morning bus with Vietnamese Karaoke, getting swindled at least twice and seeing a motorcycle death along the way. And once there, we did deep water soloing – climbing rocks without a rope over water – that was also pretty thrilling. Then of course, we returned to you and Filou in central Vietnam only to be evacuated from the beach to an inland hotel because Typhoon Haiyan was coming towards us. So the most thrilling “activity” would have to be Vietnam. Rose: Riding a motorbike in Thailand in my bikini – and trying not to hit an elephant – and motoring on a motorbike in the absolute insane traffic of Vietnam where lights or traffic rules do not exist! 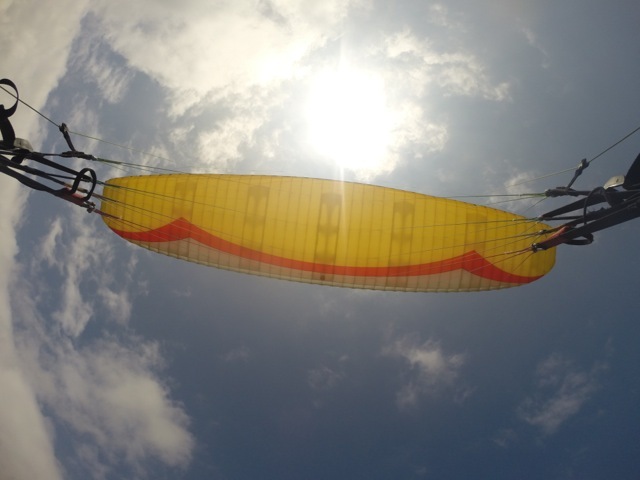 Paragliding in Canoa, Ecuador and swimming with sharks, huge tortoises and sea lions on the Galapagos Islands. Felix: Climbing up on tall, funky looking climbing walls, playing laser tag, skating and going to the science lab at Kid’s World in Phnom Penh, Cambodia. 6. BESIDES FAMILY AND FRIENDS: WHAT WAS THE ONE THING YOU MISSED MOST ABOUT HOME & THE ONE THING YOU COULD NOT HAVE DONE WITHOUT ON THE TRIP. Anthony: Missed most: I didn’t realize how much I missed the clean and green spaces of Toronto until I got home. The world is not so proper and organized. Couldn’t have done without: Besides my co-travellers? My iPhone. Might sound trivial but it was my camera, my connection to locals and folks back home through phone, email and social media. I could have survived with half the clothes, my guitar and my iPhone alone. Rose: Missed most: Fresh green salads with lots of yummy things in them. Couldn’t have done without: Earplugs; the world is an awfully loud place…and my I-phone for pictures. Emile: Missed most: Sushi, Greek and Indian Food. Couldn’t have done without: I-Pod to read and contact friends. Felix: Missed most: Canadian Summer Camp. Couldn’t have done without: My mom. 7. WHAT DID YOU LEARN ABOUT TRAVELLING THE WORLD? Anthony: I learned that there are many, many different models for how people live and work and that around the world, some folks actually build their work around their lifestyle – foreign concept for us in the West. I consider myself a tolerant person but I tried even harder not to snap judge those who come at life from a different perspective and who have made choices different from mine. 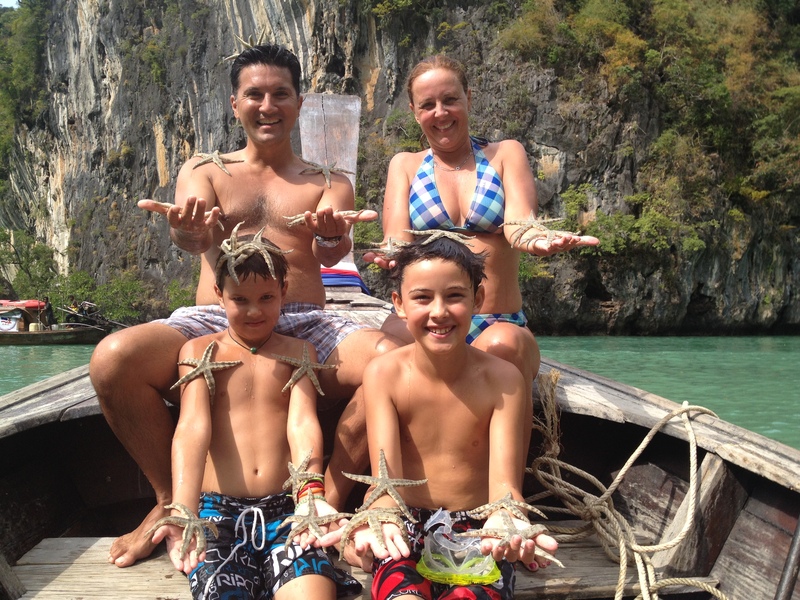 Rose: Our “once-in-a-lifetime” travel experiences have made me live more in the moment. They’ve also shown me to value friendships more and be more accepting of others – as people from all around the world have accepted our family this past year and showered us with their kindness. I have learned to have deeper compassion – as it is amazing to see how the rest of the world lives. How can you not care? I also hope that we as a family have lost our sense of “entitlement” and that from now on, we will appreciate that the truly important things in life are not material items, but the creation of unforgettable memories with those you love! Also, I learned that world schooling is amazing (although I have a whole new respect for teachers) and that travel brings out enormous creativity in children. And finally I have learned to appreciate that there are many ways in which to achieve work-life balance and enjoy life! Emile: That I am very lucky to have what I have! Felix: I never thought Asia would be so poor and that you can make nice friends all around the world. Family: Paragliding, swimming with white-tipped fin sharks, huge turtles, sea lions, penguins, rays and other amazing marine creatures, eating guinea pig, sitting in a cave mud bath, swimming in a hot & cold geyser stream, floating on a bamboo raft down a beautiful river surrounded by Karst mountains, dancing on stage in front of the Eiffel Tower, going out on a night boat to see fire-flies, rock-climbing and deep-water soloing, eating cricket cookies, flying on a 6-seater plane, volunteering at an amazing Elephant Park. Anthony: Let’s just say that I am now a Spanish-speaking rock climber and yogi who has reconnected with his musical sensibilities and enjoys reading somewhat esoteric French novels. Oh, I have tried, and succeeded, in not wearing a tie for a year! Rose: Blogging, learning to deep-sea dive, be an actress in a commercial, riding a motorcycle on the left side of the road, in insane traffic with no rules, with a child in the back, preparing to be evacuated for a hurricane, learning what world and un-schooling is all about, taking a Chinese and Vietnamese cooking class in the local countryside. Emile & Filou: Learning to surf, zip-lining, fishing a 30LB lake fish (E), learning to play the guitar (E) and piano (F) and sing, performing music on stage, presenting world travel to a group of Dutch school kids (E), cheering on the Dutch soccer team like never before (E), standing up in the back of a pick-up truck that was driving fast, making a bon-fire by myself (E), learning Spanish, hand-weaving a bracelet, poi dancing (F), skinny dipping, holding a live lobster, taking a Vietnamese cooking class (made a delicious curry – F), riding on a FAST motorcycle with no helmet while being squeezed between mom & the driver (F), learning to compose my first original song (F), karaoke singing, volunteering in a dog shelter, collecting starfish out of the ocean, sleeping in a hotel completely made out of salt, being chased by a monkey (F) and getting our first massages in Cambodia and Thailand. 9. DESCRIBE WHAT THIS PAST YEAR HAS BEEN LIKE FOR YOU. WAS IT WHAT YOU EXPECTED IT TO BE? Anthony: On the surface, it was an unforgettable experience of new places, new friends and tons of discoveries, both geographic and gastronomic. But below that surface, I think we will realize gradually how the year has taught us to communicate better, to appreciate more and to contextualize our life through a broader perspective. As a parent, one of the profound takeaways was of course sharing these experiences with the boys, discussing their impressions and watching them learn and develop. Virtually everyone we met was excited about how such a trip would shape them as men. And while I, too, am eager to see how they develop following this year of privileged family time, there’s a part of me that just wants to hold on to those moments of holding their hand while walking on a beach in a far off country somewhere in the world. Rose: I only had one major goal for this year and that was to experience, learn and grow as a family: to create unforgettable memories for a lifetime. This year has given me all that and sooooooooo much more! Emile: It was so much more exciting – and we made so many more friends than I expected! Felix: Exactly what I expected. Very best year of my life! 10. WHAT DO YOU THINK ABOUT STARTING A NEW ADVENTURE IN BANGKOK, THAILAND? 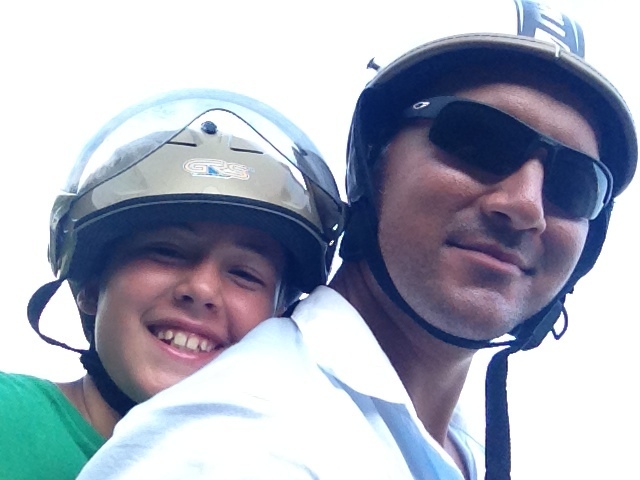 Anthony: I’m inspired and grateful that we have found a way to combine the adventure of travel and so-called normal life. 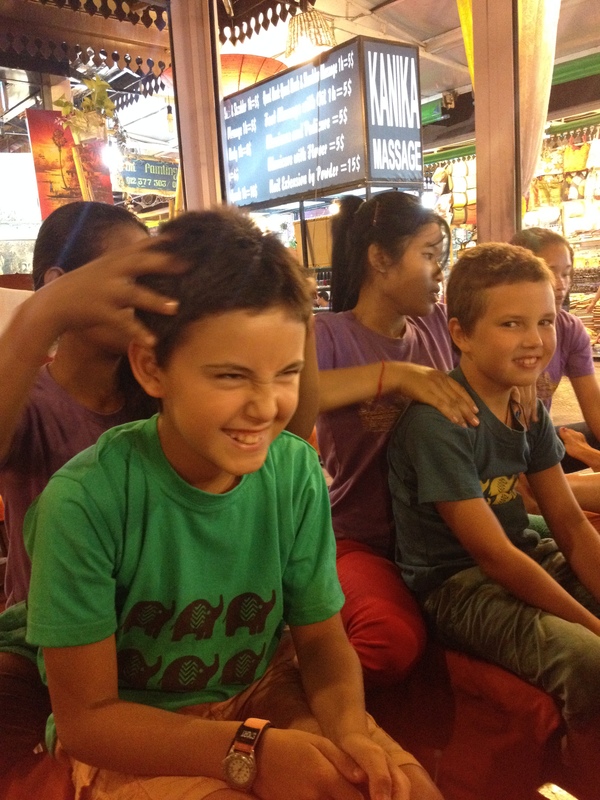 Thailand holds new opportunities for growth for all of us: the kids in an international school (or any school, for that matter!) and Rose and I starting a business in the ASEAN region. We are also fortunate that all family members are unselfish and lovingly supportive of our decision. Rose: Just thrilling…A new start which will once again bring many new learnings, challenges and incredible joys. Thailand, here we come! Emile: Can’t wait, it’s going to be awesome! Felix: I am excited about going to Lycée Français International de Bangkok as this school has a science lab, track & field, pool etc. Here I will be meeting lots of new, international friends. 11. WHAT ADVICE WOULD YOU GIVE OTHERS ABOUT FOLLOWING THEIR DREAMS? Anthony: I don’t have any advice. While I realize this year of travel was a big deal in many respects, for me it was just something we needed to do. The tour itself was truly amazing, but I don’t think that our decision to do it was amazing. It just felt right for our family at this time, and so we went with that feeling. Emile: Just do it. It’s awesome…make the most of it! Felix: Following your dreams will make you HAPPY! With incredible thanks and gratitude to Anthony, Emile and Filou for their exploratory and open minds. You guys have made this world travel experience for me what it was; a life-changing, incredible journey that I will carry in my heart forever. You are the loves of my life. Now and always! The ecologically rich islands of Galápagos are a magical place to observe biodiversity and enjoy many enchanting natural wonders. Galápagos is the most important tourism destination in Ecuador and was declared a World Heritage Site by UNESCO in 1979. The number of endemic species of flora and fauna inhabiting this paradise, which informed Charles Darwin’s Theory of the Evolution of Species, was given the nickname: The Enchanted Islands. The geographic isolation that characterizes this archipelago – located about 1000 kilometers off the coast – has transformed the region into a biological laboratory of great interest for both tourists and researchers. The province of Galápagos consists of 13 large islands, 6 small ones, 107 inlets and countless rocks, all of them of volcanic origin. From Guayaquil, we flew into the tiny island of Baltra; the world’s first ecological airport. 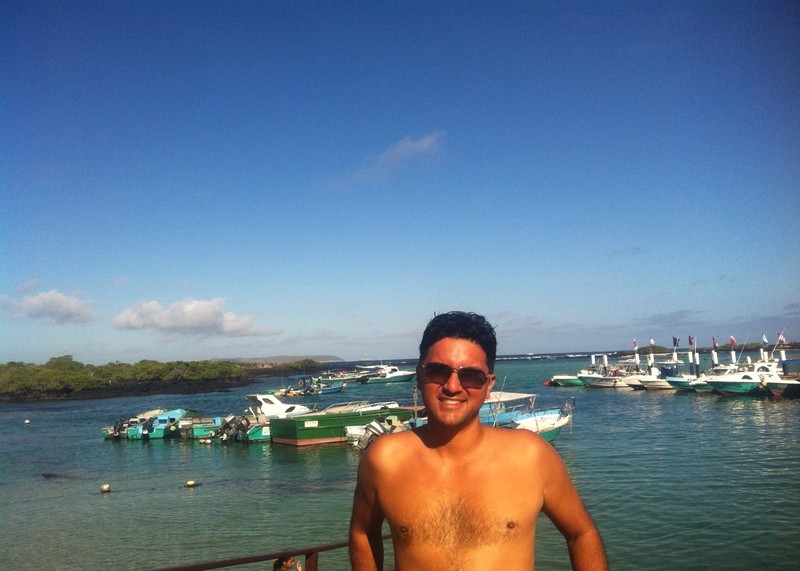 Here, we took a 10-minute ferry over to the largest and most populated island of the Galápagos named Santa Cruz. To think of the Galápagos, is to think of tortoises. The very name, Galápagos is derived from an old Spanish word referring to their saddle-like shape. So on our way to the town of Puerto Ayora, we stopped at the Fausto Llerena Tortoise Centre – where giant tortoises roam freely. They live there in muddy Mother Nature, so we put on some boots and went exploring. Not soon after we left, we found some – and they were so impressive and gigantic! 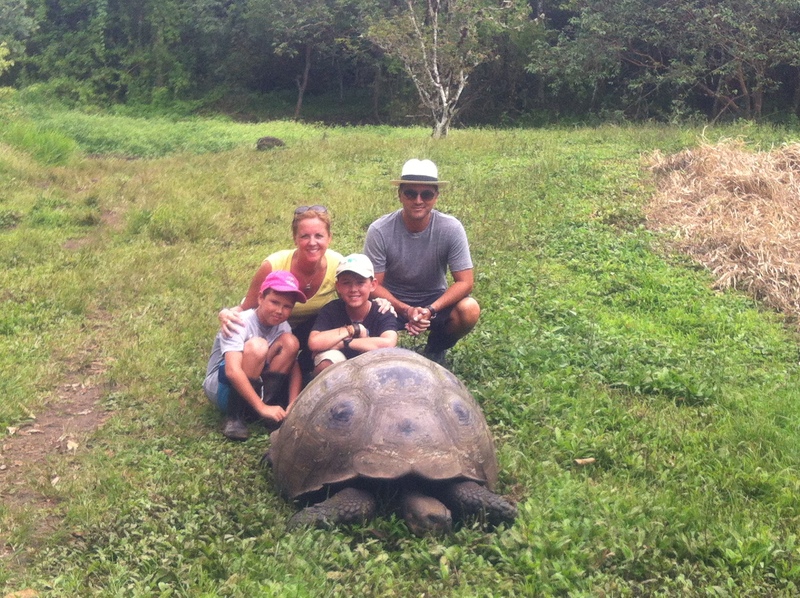 We learned that the giant tortoises are the most celebrated animal in the region (about 15,000 to 17,000 are left here) and can grow up to almost 600 pounds (270 kg), with a curved carapace length of about 4 feet (1.22 metres). Surprisingly, they live well over 100 years – some reach it all the way to 200! On our second day, we took a 40-minute hike up to Tortuga Bay Beach. After about half an hour, we reached a perfectly preserved beach with incredibly high waves. Filou was ready to show off his surfing skills but unfortunately this beach is forbidden to swimmers as it is preserved for wildlife. After a stroll along this beautiful sandy beach, we reached a gorgeous inlet with stunning blue water. It was here that we were allowed to swim and observe wildlife. 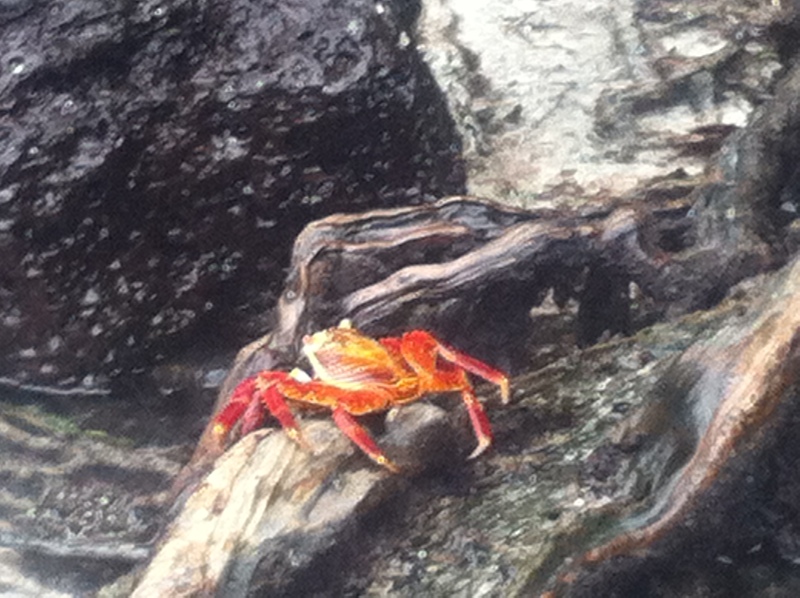 We saw a colony of black marine iguanas on the beach, several beautiful pelican birds (one was bathing right in front of Emile & me), a stoic heron and many colourful, large, red Sally Lightfoot Crabs. Our last day on Santa Cruz, we headed by ferryboat for Las Grietas. Once across the pond,we walked for 20-minutes through enormous cacti and over impressive lava rock formations. Las Grietas, which literally means “the cracks”, is a geologic formation; a canal formed between steep lava rock cliffs on either side. It’s a really beautiful hide-away and unique swimming hole (a mix of salt and fresh water come together here which makes for crystal-clear, snorkeling water). The kids loved swimming in this cove and saw the most amazing blue-yellow fish. Also, as is commonly done here, Filou jumped into the water pencil-style from a high rock ledge. It was then that he made a remark that describes him so well. 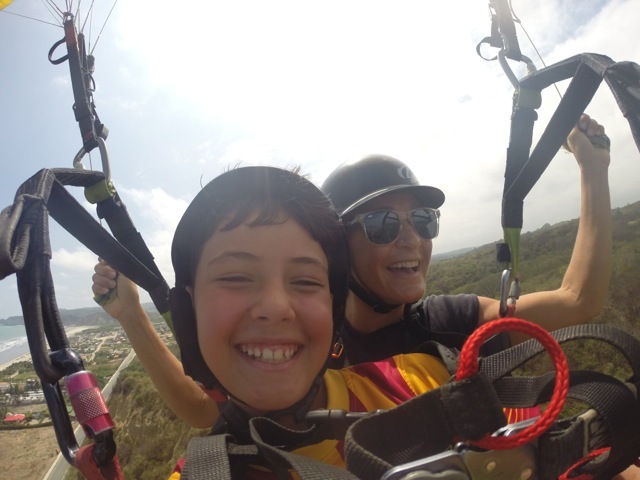 He said: “But mom and dad, you know – I was born to risk my life” (with the biggest smile on his face)! Anthony too jumped from the high perch, but without the whimsical quotable that Filou offered! And after 3 wonderful nights at Casa Tortuga (a gorgeous 2-bedroom bungalow with amazing amenities) (http://www.flipkey.com/puerto-ayora-vacation-rentals/p295060/), we were ready for our 2-hour boat ride to the next island: Isla Isabela. We heard some stories about what the 2-hour boat ride from Santa Cruz to Isabela was going to be like, but nothing could have prepared us. I would say that this was an “once-in-a-lifetime experience” (but then not in a good way). A small boat with 22 people, trying to work itself through extremely rough waters – I counted 16 baggies of puke; need I say more? (and yes, the boat crew is completely prepared with black plastic bags and Kleenex; they know what’s coming! And the 16 bags were only on the lower deck; God knows what was happening above us). Very happy that our family kept it together! Our strategy: lots of stomach muscle tensing, staring at the horizon and no breakfast. We were handsomely rewarded with the most stunning blue-green ocean waters, a group of cute penguins swimming alongside our boat, and several sea lions sunbathing on deck, as we entered the harbour of Puerto Villamil. That afternoon we took our first swim and had the most amazing playtime with sea lions; they were swimming and twirling all around us – just incredible! One sea lion even slightly touched Filou; he loved it and said it had the softest skin. Emile had the same experience the next day when several sea lions came up close to hang out and play. What a treat! 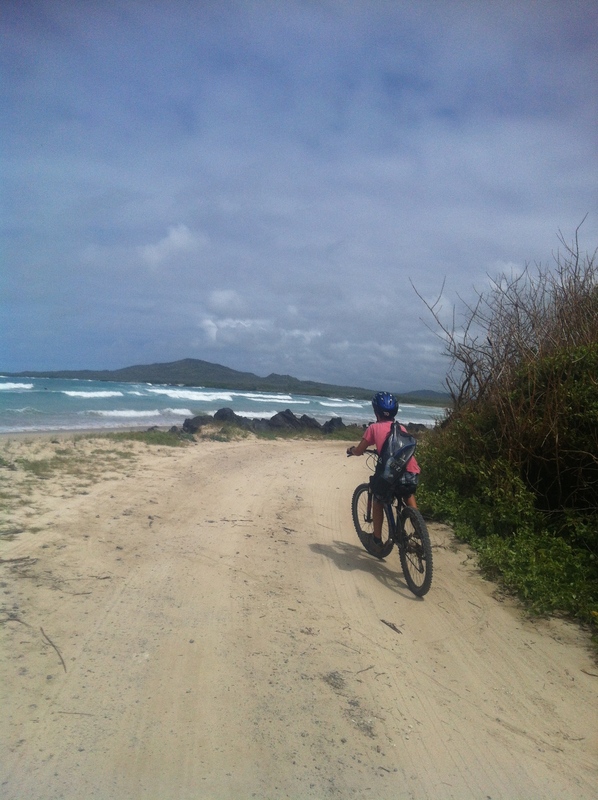 The following day, we strapped our snorkeling equipment on our backs, rented bikes and went to explore the island. First we stopped at the local UNESCO funded Tortoise Conservation Centre, which houses various sizes of tortoises; many of which have experienced high levels of poaching within the last 10-20 years. We saw both hatchling tortoises and older breeding animals. Emile particularly liked the little ones. From there, we passed a beautiful pond with 15 majestic, pink flamingos. Then, heading in the other direction, we rode all along Isabela’s gorgeous coastline to find a good snorkeling spot – which we did locate at Playa del Amor. 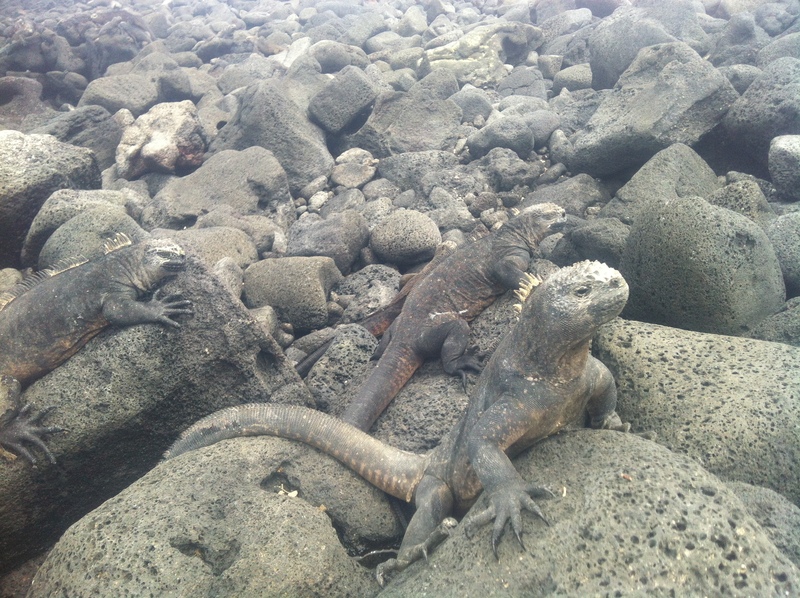 Here we had a refreshing swim and a chance to observe large marine iguanas up-close. All in all it was a lovely, relaxing day of observing wildlife and taking in scenery. However, the next day was even better for “los animales”. 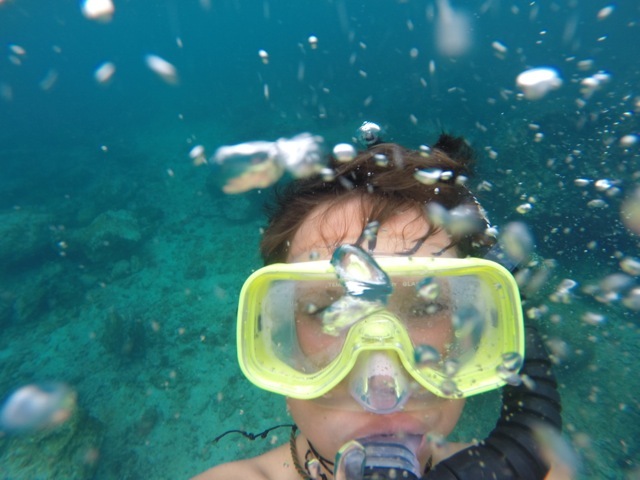 We booked a snorkeling tour with Rosedelco Tours and were off to Los Túnelos. After a thrilling, 45-minute boat ride with Captain Leonardo (who was the spitting image of John Travolta) & crew – we arrived at our first snorkeling destination. Here, we quickly spotted several large Manta and Golden Rays. Then we moved on, to locate the most anticipated marine species of all (especially by the boys); the White Tip Reef Shark! We first saw some hiding in a cave, but quickly we had them swimming right by us. Apparently these sharks are rarely aggressive towards humans as they have an abundance of food in the area, but still… pretty exhilarating to see several 5-foot sharks swim right underneath you! 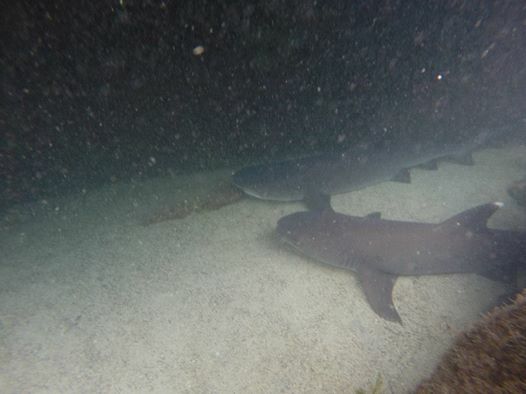 To prove we really swam with them, here’s a shot of a couple of White Tip Reef Sharks. Next, we swam against some strong currents (kudos to the kids for keeping up), and arrived at the area of the giant tortoises. It was very cool to see these enormous, pre-historic animals majestically float in the water: especially as they come right up to you. Then it was break-time and we got back onto our boat for a delicious sandwich lunch and some local, sweet treats. 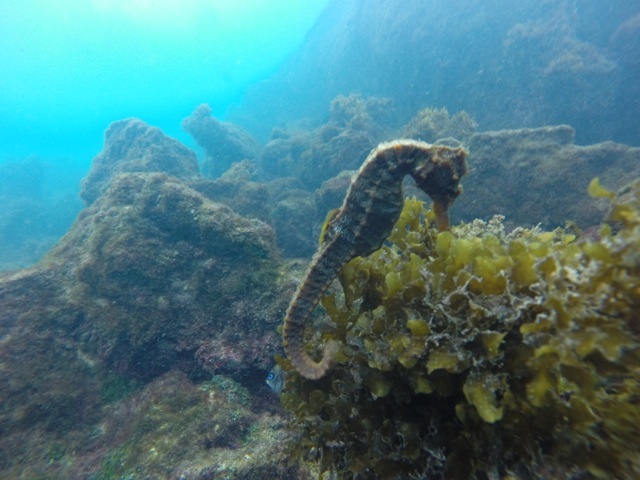 Round two of snorkelling was aimed at spotting the impressively, large Pacific Sea horse (of which we saw several). 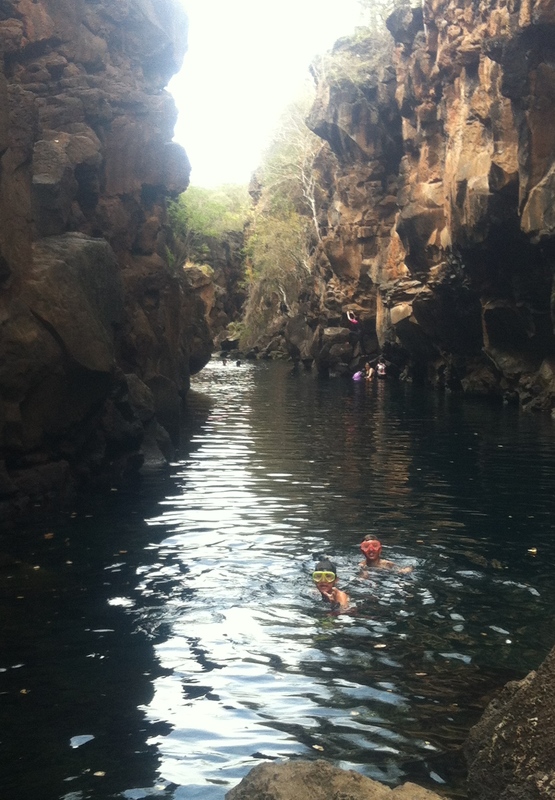 To conclude the snorkelling part of the tour, Emile braved deep waters to swim under several arched rock formations. 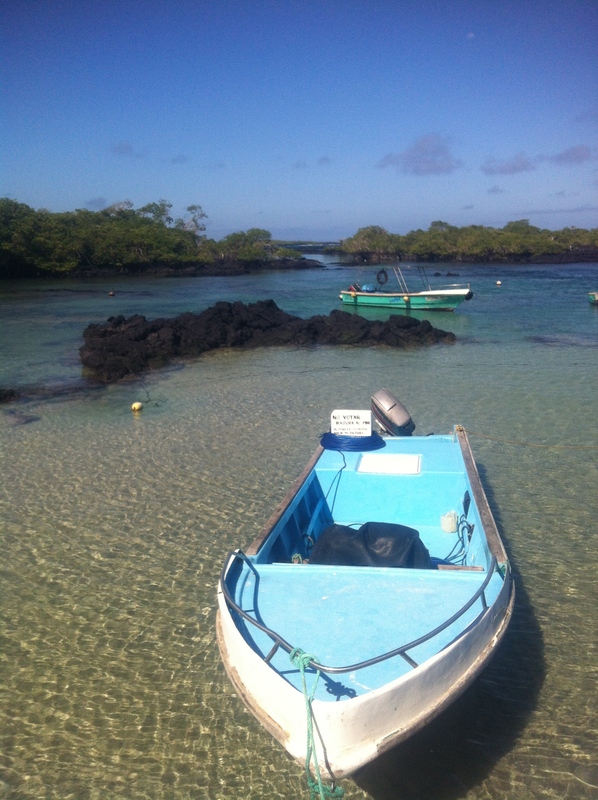 After being warmed-up on our boat, we made one last stop at the area known as Los Túnelos. It is here that lava has formed beautiful arcs in the ocean. 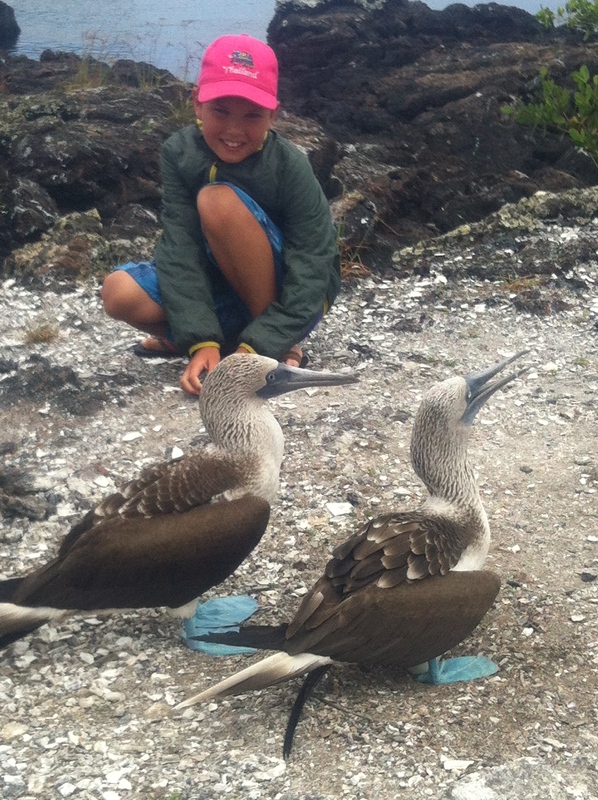 We got off to walk around a bit, take in the scenery and spot the famous Galápagos Blue-Footed Booby birds. These birds, especially the males, take great pride in their fabulous feet – especially during mating season, as the bluer the feet the more attractive the male is considered to be. The colour of their webbed feet actually comes from carotenoid pigments that are obtained from their fresh fish diet. And the healthier the boobies are, the bluer their feet. Also, boobies nest on land and lay only 1-2 eggs each year (of which only the strongest hatchling will survive). 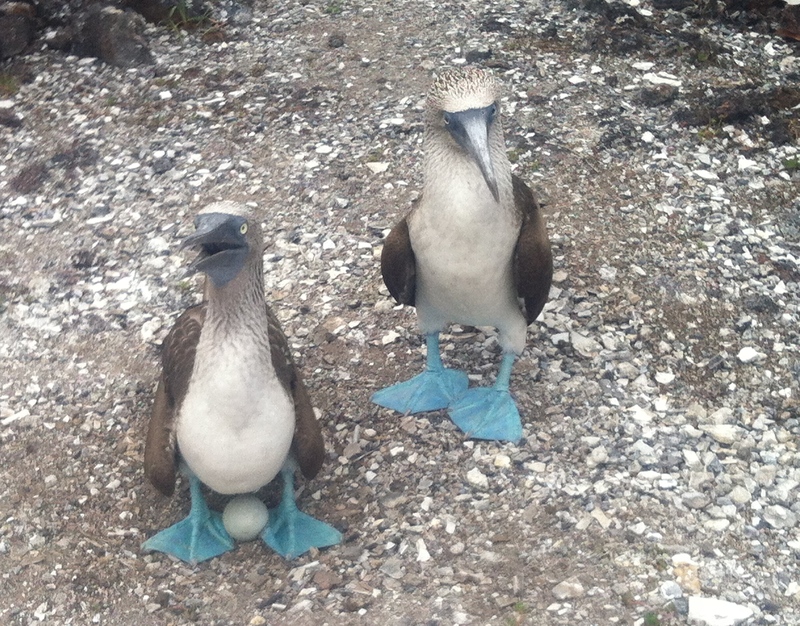 Therefore, it was pretty special for us to see a set of boobies safeguarding their egg. 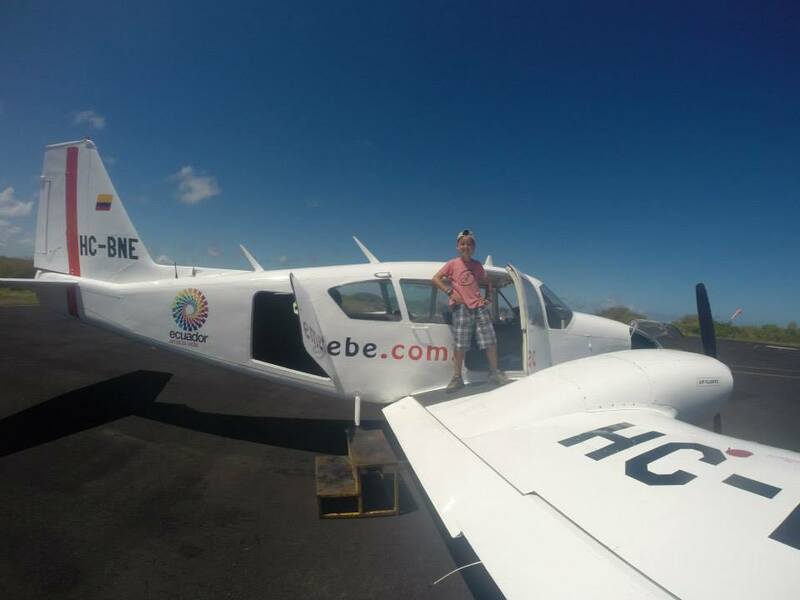 From Isabela, we took a flight, on board a 6-seater airplane (pilot included), to the next and final island: San Cristobál. The ride was thrilling, especially for Emile who sat in front with the pilot (window open and all!). As you can probably imagine, flying over the Galápagos Islands, gave us the opportunity to take in some magnificent views. 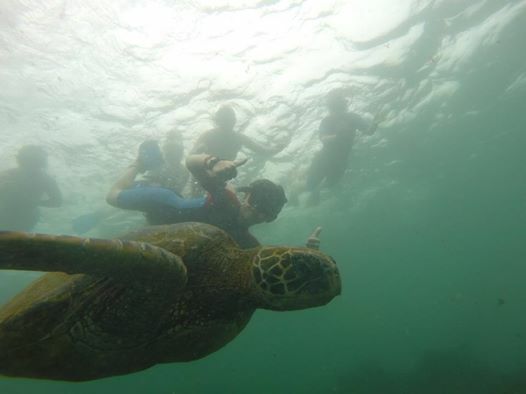 Once on the island, we jumped right in with a day tour to the most popular snorkeling spot in the area: León Dormido (also called Kicker Rock). We booked with León Dormido Expeditions and took a fabulous catamaran boat to this popular landmark and snorkeling spot. It is here that two majestic volcanic rocks (remains of a lava rock, split in two) tower about 140 metres tall above the ocean. When viewed from the south, the formation looks like a sleeping lion, hence the name Spanish name León Dormido, while from another side it looks more like a boot (soccer shoe? ), hence the English name Kicker Rock. 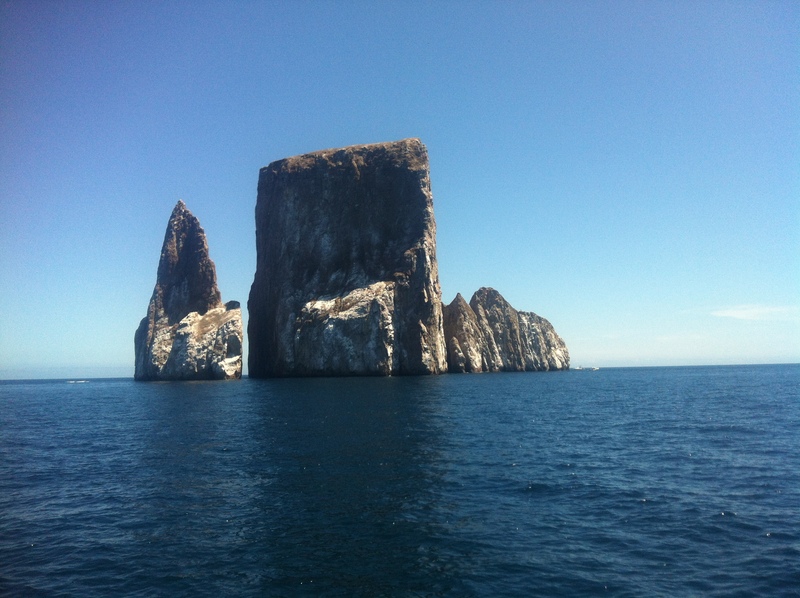 Apart from its scenic beauty, Kicker Rock is the best place to spot sharks in the Galápagos, so of course the boys were excited to go! We were instructed to swim through the narrow channel between the two rocks. The water was crystal-clear in there, and the bluest we’ve ever seen. All along the rocks, we found the most magnificent brightly coloured fish, including the spotted Eagle Ray (we saw a massive one!) and many sharks. We saw several Galápagos sharks (and some Black Tips), but unfortunately the Hammerheads were not around during our swim; these were the ones Emile really wanted to see! 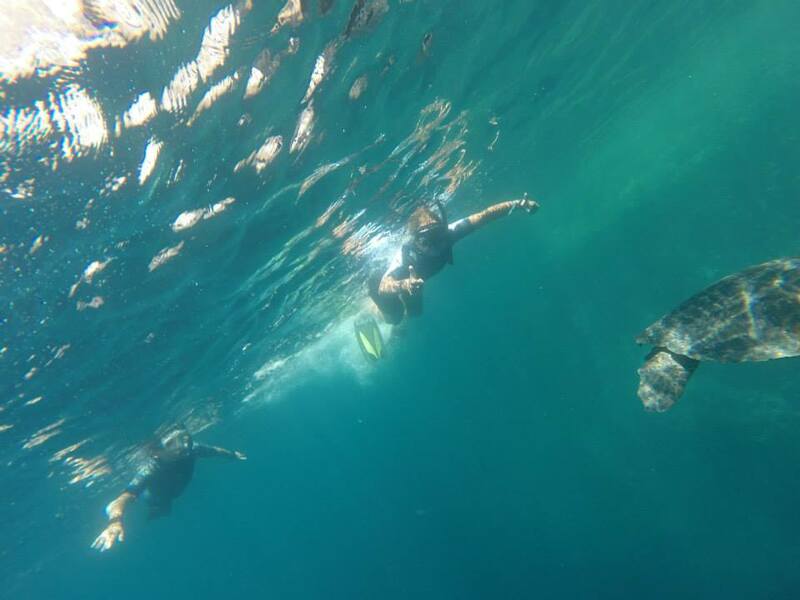 Nevertheless, we had a fantastic day in the water – in certain spots it looked like we were floating over a carpet of fish (so many of them together)….. and of course swimming with the many tortoises and sea lions was phenomenal; they are just so majestic and impressive in the water. 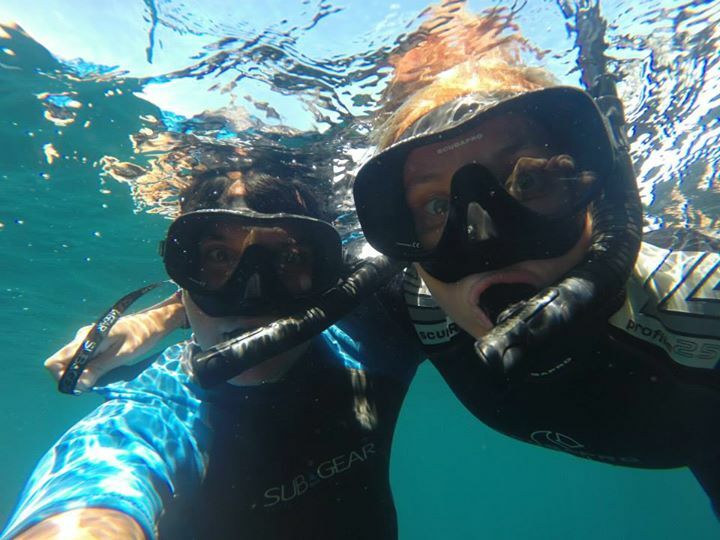 Emile and I, swimming with some giant tortoises. Great fun! 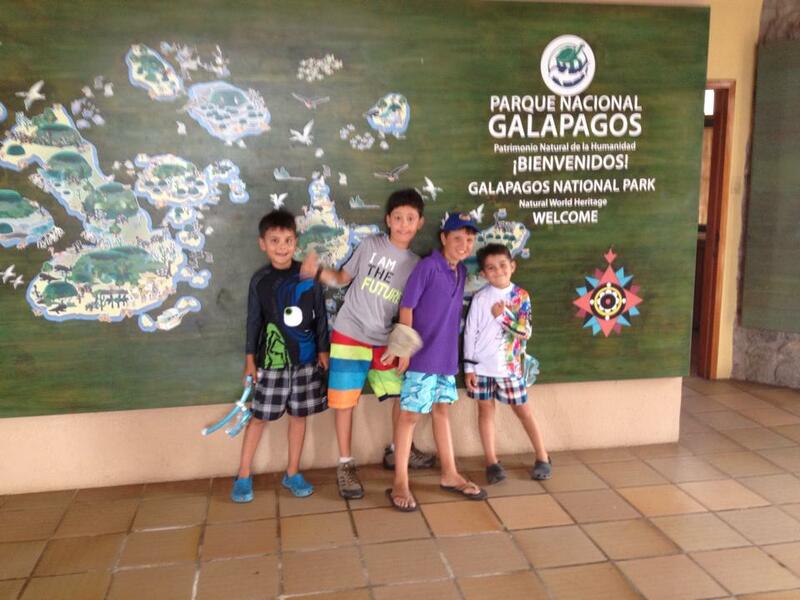 On our winding path leading to Las Tierretas, we visited the Galápagos National Park Visitor Centre with them. Here, we learned about the natural processes that have made the Galápagos such a unique place (a complete and documented history of the Galápagos, its ecosystems, flora and fauna was presented here). As well, there was lots of information about the efforts underway to protect and preserve the islands. Then the kids were ready for their last snorkel. And what an amazing one it was – almost like a dance with baby sea lions (Filou got to use the GoPro under water camera for the first time and captured some great shots). 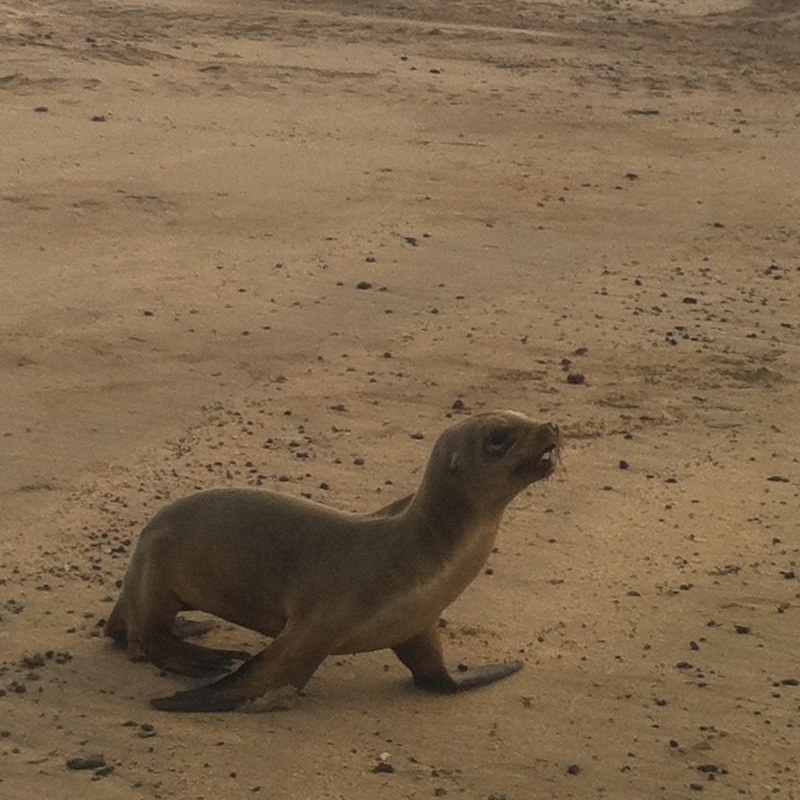 It was fitting that we ended with sea lions as the island of San Cristobál, is particularly known for them. We got to observe many up-close, both in and out of the water. Our conclusion is this; as majestic as sea lions are in the water, as sleepy, coughing, stinky and awkward they are on land. There are so many of them in the centre of Puerto Baquerizo Moreno that you have to be seriously careful sitting down on a bench as it might be taken! 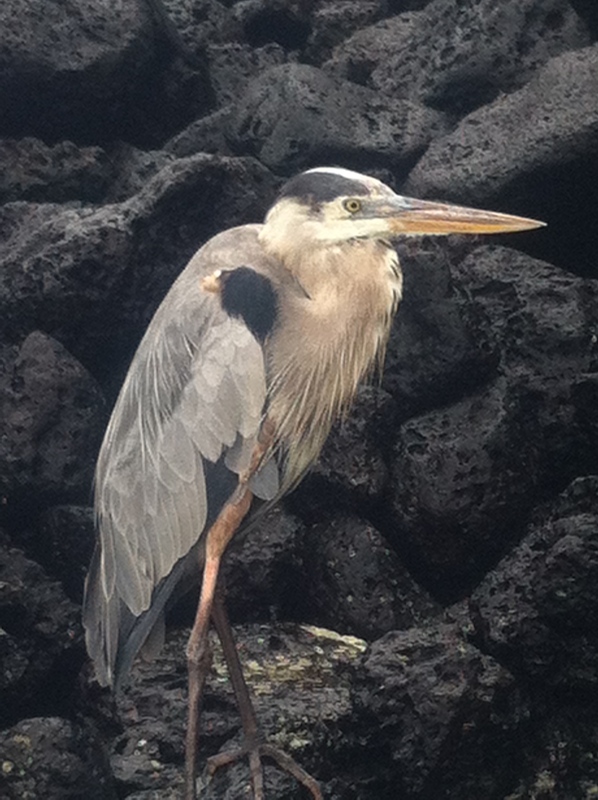 San Cristobal, the capital of EL PARAISO, quickly became our Galápagos favorite. Efforts put forth to keep this earthly paradise intact have been great; a wonderful conservation example indeed and perfect finale to our REgeneration Tour (http://the-regeneration.com). And now, I sit here on our 30th and last world tour flight, thinking of my very first international flight to Portugal when I was only 11 years old. I vividly remember the excitement of soaring higher and higher and seeing that beautiful white blanket of clouds that just makes you want you to jump in. Now here, some 30 years later, I am once again looking out the window of an airplane, marveling at that gorgeous sky (with stunning red glow as the sun is just rising) and that same tingling, travel excitement, feeling is rising. I envision and hope that my boys will have similar vivid memories of their first travel experiences; we have certainly given them some to remember this year. The world is stunningly beautiful and so worthy of exploring and protecting. 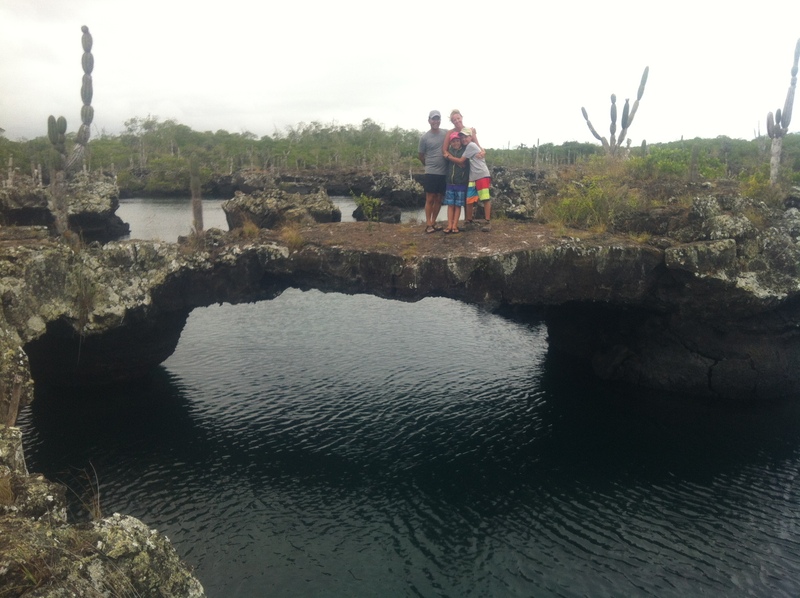 Thank you Galápagos, your paradise was our “icing on the cake”; a fitting end to an incredible year of adventure, exploration and unforgettable world-travel with my three wonderful men – for which I am more grateful than can ever be expressed….Y.O.L.O! Note: There will be one more blog that recaps our round-the-world-trip reflections and thoughts.